The period of time during which the system is ready to receive voice commands and to carry them out is called a dialogue. The system gives audible feedback and guides you if necessary through the relevant functions. 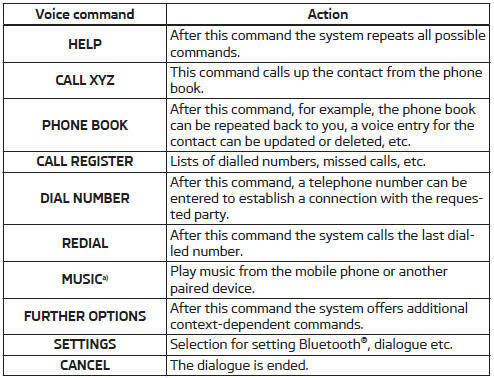 Optimum understanding of the voice commands depends on several factors. Speak with a normal tone of voice without intonation and excessive pauses. Close the doors, windows and sliding roof, to reduce or stop disturbing exterior noise. It is recommended to speak louder at higher speeds, so that the tone of your voice is louder than the increased surrounding noise. During the dialogue, limit additional noise in the vehicle, e.g. passengers talking at the same time. Do not speak, if the system makes an announcement. The microphone for voice control is inserted in the moulded headliner and directed to the driver and front passenger. Therefore the driver and the front passenger can operate the equipment. The telephone number can be entered as a continuous series of individually spoken digits (the whole number at once) or in the form of digital blocks (separated by short pauses). After each order of digits (separation through brief voice pause) all of the digits detected up to now are repeated by the system. permitted. The system detects no continuous digit combinations such as twenty-three, but only individually spoken digits (two, three). adapter » Fig. 100 on page 96 briefly. Press the 1 button on the multifunction steering wheel briefly » page 95, Operating the phone on the multifunction steering wheel . Press the 1 button on the multifunction steering wheel briefly. If the system is expecting a voice command, you can end the dialogue yourself as follows. with the CANCEL voice command. The dialogue of an incoming call is immediately interrupted. The voice control is only possible in vehicles fitted with a multifunction steering wheel with telephone control or a phone mount and adapter. a) On vehicles fitted with the Amundsen+ navigation system, this function can be accessed via the navigation system menu; refer to the » Operating instructions for the Amundsen+ navigation system. If a voice command is not detected, the system answers with “Sorry?”, and a new attempt can be made. After the 2nd error the system repeats the aid. After the 3rd. failed attempt, the answer “Cancelled” is given and the dialogue is ended. If automatic name recognition does not work reliably for some contacts, you can choose to save your own voice tag for the contact in the Phone book - Voice tag - Record menu item. Your own voice tag can also be saved using the voice control in the FURTHER OPTIONS menu.